South Devon is one of the UK’s top Sea Kayak destinations and we are based in Dartmouth which sits in the heart of this stunning coast. There is an amazing variety of trips on offer here and we pick launch locations with the aim of giving you a truly memorable day out. The jewel in South Devon’s crown is Dartmouth and we run most of our trips from here. 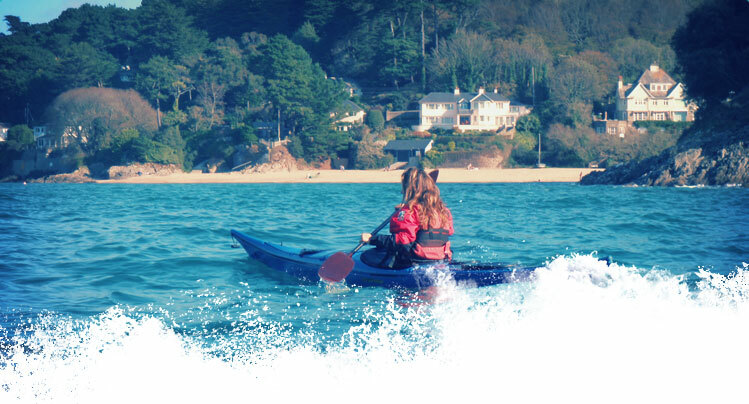 You can get to grips with your kayak in the calm Oak lined creeks of the estuary before venturing out onto the sea with it’s spectacular cliffs, golden sand beaches and Seal colonies. Our 5 day courses will launch from a number of locations depending on the conditions and the group and if you have kayaked with us from Dartmouth before and fancy exploring a new section of coast please get in touch and we will be happy to help organise this for you. While we're based in Dartmouth, we have access to a variety of unique launch sites along the south Devon coast. These fantastic locations have all been hand-picked for their unique properties, such as suitability for beginners, protection from prevailing winds, etc. Chief Instructor James was born in Torbay and grew up exploring the diverse coastline, varied rivers and rugged moorland that the area has to offer. His kayaking adventures, over the last 20 years, have led him to France, Italy, New Zealand, and most parts of the UK, including the Isles of Scilly, North Wales and Scotland. He has also paddled the entire Devon and Cornish coastline, both North and South, as well as completing a solo crossing from Lands End to the Isles of Scilly. When James is not sea kayaking, he can be found indulging in his other outdoor passions, which include; white water kayaking, climbing, surfing and coasteering. He has a huge enthusiasm and love of the great outdoors, and he continues to live and work in South Devon where he can enjoy pursuing his outdoor activities in such a beautiful environment, and share his knowledge and experience with others. James Qualifications: British Canoeing Level 3 Coach and 5 Star Leader in both sea kayaking and inland paddling, as well as a 4 Star Leader in Open Canoe. His other qualifications include; RYA Day Skipper, Powerboat Level 2, Walking Group Leader and SPA climbing award. Instructor Kieran was born in Torbay and grew up exploring South Devon with the local Sea Scouts, taking part in Sea and White Water Kayaking, Canoeing and Sailing. His love of the outdoors and paddle sports drew him to Scotland where he completed his guide training and a degree in Adventure Sports. Here he founded the University of the Highlands and Islands Paddle Sport Club that led expeditions around the west coast and rivers of the Highlands. Kieran has also paddled in Japan, Canada and Australia and his love of mountains took him to Annapurna Base Camp in the Himalayas. On returning to South Devon, Kieran now enjoys guiding new paddlers and enthusiasts around the coastline for fun and discovery or assisting them in their personal development. He loves Rock-Hopping, Surf Kayaking, SUP boarding and finding the local Seal community. His relaxed pirate adventures to hidden coves for Roasted Marshmallows are a family favourite; as he is always up for banter and brings an element of humour and history to his tours. He is a trainer and assessor of the D of E award, British Canoeing 1-3* and is very much at home when getting away from it all on an overnight expedition of the stunning South Hams Estuaries. Qualifications: British Canoeing UKCC level 2 Sea Kayak Coach with Moderate Water Endorsement, 4* Sea Kayak Leader, 4* Open Boat Leader, Paddle Ability Coach, Trained 5* Sea Kayak, Trained 4* Inland Kayak, D of E Gold Trainer and Assessor, Leave no Trace Trainer, BMC Trained Mountain Leader, RYA Advanced Power Boat Operator, RYA Safety Boat Operator, RYA Day Skipper, RYA Sea Survival, AoFA Level 3 First Aider, REPs Fitness Instructor, BA Hons Adventure Tourism Management, Bsc Outdoor Education. Bookings Soph is our newest addition to the team and from 2017 she will be helping run the bookings office. Soph is a true Devon girl and if you call us to book your trip you will be delighted by her friendly and efficient service! She has a wealth of local knowledge and will be able to answer all your questions and give you the advice you need. Head Chef and Bookings The one and only amazing Kay is responsible for keeping us all in check! She will do an expert job of organising and booking your kayak trip. Kay is also our head chef so if you manage to join us for a catered overnight wild camp it’s Kay’s delicious food that you’ll be eating! Kay worked for many years as head chef at an exclusive survival and expedition centre on a remote Scottish island so she knows just what a hungry adventurer needs. You will be completely amazed by the incredible food she prepares and we are sure you will never forget her home baked chocolate brownies! Instructor Lizzy is originally from Scotland and she has paddled all over the West Coast and many of the most famous Scottish rivers. She has also led many expeditions in the French Alps and worked for 2 seasons leading trips down the beautiful, hot gorges of the Ardeche. She loves organising trips so she can share her knowledge and passion with others and her friendly confident coaching style will help you have a very memorable day out exploring the coast. Lizzy’s Qualifications: UKCC Level 3 Sea Kayak Coach, Level 2 Kayak Coach, 5 Star Sea, 4* Canoe, 5 Star White Water, BASI ISIA (Level 3), BASI Adaptive Level 2, SPA Trained, RYA Safety Boat Coastal. Instructor Drew grew up in Devon and has been paddling on the sea and the surf for as long as he can remember. He is also a keen White Water paddler and if it’s raining hard he can usually be found high on Dartmoor hunting out the rivers that are in spate! Drew’s infectious enthusiasm and friendly personality will quickly have you relaxed and enjoying your trip. Qualifications: British Canoeing UKCC level 2 coach, 4 star Sea, Moderate Water Endorsement. Instructor Elisabeth started canoeing in her teens in the Lake District during summer holidays, paddling on Lake Coniston. Later at Bristol Polytechnic she joined Bristol Canoe Club and started getting seriously into white water kayaking. Eventually her profession as a sculptor and artist led her to a move further south to Brixham. It was here, through the Ibex Canoe Club, that Elisabeth discovered a passion for sea kayaking, participating in many club trips and also getting into coaching as a way of putting something back into the sport. Elisabeth has paddled white water on many of the UK’s best rivers, as well as some of the French Alps classics. Her sea kayaking has taken her from Devon and Cornwall and the Isles of Scilley, through North Wales and Scotland, and all the way to New Zealand. Some of her more notable achievements include a crossing to Lundy Island and back, kayaking the entire Devon and Cornish coastline, circumnavigating Anglesey in two days, and exploring the stunning Isles of Scilley. One of Elisabeth’s most well known local pieces of artwork is her Mermaid sculpture, which sits on the rocks at the entrance of the River Dart near Dartmouth Castle. Elisabeth is a British Canoeing Level 3 Sea kayak coach and British Canoeing 4 Star Sea kayak Leader.